The impressive run of Rohan Bopanna and Édouard Roger-Vasselin in Miami Open came to an end on Monday, as they lost 7-6 (7-5), 6-2 to the American duo of Steve Johnson and Sam Querrey. After putting up a fierce fight in the first set and losing, the Indo-French duo gave up in the next one. The Indo-French duo had looked sharp in this campaign and was at their persistent best on Monday too before all their hard work summed up to a narrow defeat against Johnson and Querrey. They started off brilliantly by getting a break point in the first serve itself taking an early advantage. However, their slender one-point lead was thrown away in the 10th game when the American duo broke them to level scores at 5-5. 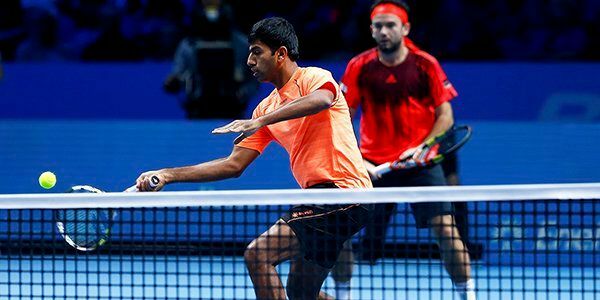 With the match going to the tie-breaker, Bopanna and Vasselin lost thrice on their serves, eventually giving away the first game 7-5 to their opponents. The fighting loss had taken a big toll on the duo’s confidence and persistence, and it was reflected in the first game of the second set as they failed to save break point twice. The American opponents, however, didn’t make the same mistake as their opponents and held on to their serves. The pressure was showing and Bopanna and Vasselin failed to save yet another break point in the seventh game. The match ended 7-6 (7-5), 6-2, as the American duo wait to know their next opponents in the quarter-finals.